When you've got a DIY project to work on that's not near an electrical outlet, you need a cordless drill to do the job. The best 20v cordless drill out there provides plenty of torque, plenty of options and a battery that doesn't die after just a few minutes. We looked at some of the top-rated models on the market. Read on for our picks for the best 20v cordless drill. One of the first things to look at when choosing the best 20v cordless drill is the battery. These days, pretty much every cordless drill has a lithium-ion battery (all of the drills we reviewed did). Lithium-ion batteries offer longer life and don’t have the memory problems you’ll find in NiCd or NiMH batteries. We also looked at the number of torque options each drill offered. Some, like the Black+Decker, had an 11-position clutch. The Cartman had a pretty impressive 21 position clutch. We also paid attention to “bonus” features, like a light (found on the Porter-Cable and WORX drills) and how the drills fared when it came to weight and comfort. 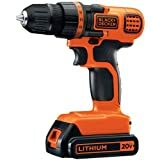 The Black+Decker 20v Max Lithium-Ion drill/driver features an 11 position clutch, which is designed to give you better control as you drill into a variety of materials, from wood to plastic. The clutch is also designed to help you avoid stripping screws when you use the tool as a driver. The drill/driver also features variable speed control, which reduces the chance of damage when you’re countersinking or creating other types of holes. 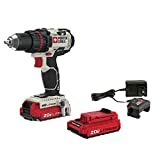 If you’ve already committed to cordless tools from Black+Decker, this might be the best 20v cordless drill for you. It’s compatible with other power tools and lawn and garden tools in the brand’s 20v Max Lithium-Ion line. Those who’ve given the Black+Decker drill/driver a try have primarily been happy with it, although many are quick to note it’s made for light jobs, only. The drill has a plastic body that some have said makes it looks like a toy. Others have complained that the batteries seem to drain much more quickly than other types of lithium-ion batteries. The 20v Lithium-ion drill/driver from Porter-Cable features a powerful motor with 330 UWO and an all-metal chuck. The design of the chuck is meant to keep bits from slipping. Compared to the Blacker+Decker, the Porter-Cable drill/driver comes packed with features. It has an LED light, so you can continue to work even in poorly lit areas. It also has a fuel gauge on the battery, so you can see how much life is left. The drill/driver is lightweight, weighing just 3.5 pounds. It’s also designed with comfort in mind and has an ergonomic grip. Although people are generally happy with the Porter-Cable drill, a few noted that theirs had quirks. Some complained that the drill gets turned on, even when they release the trigger. Some noted that the chuck was difficult to tighten, which caused the bits to wobble as they tried to work. One great thing about the Cartman cordless drill/driver is that it comes with a lot of extras. While some cordless drills only give you the drill, the charger and the battery (or in some cases, just the tool), the Cartman comes with six twist bits, six screwdriver bits, a carrying case and two battery packs. The thing that’s not so great about the Cartman is that each battery can take up to five hours to charge. That’s way too long. Back on the plus side, the drill has a light and a 21 position clutch, which gives you a lot of options when it comes to adjusting torque and avoiding stripping screws. One thing people who used the drill commented on was its stellar performance despite being a “non-name brand” tool. People were generally impressed by the power they got from the drill and the overall performance. A few complaints people had were that the chuck wobbled while in use, making it pretty difficult to drill a hole. Some also noted that the light was in an inconvenient spot. The DeWalt compact drill/driver weighs in at just 3.6 pounds, but it packs a wallop. The motor provides 300 unit watts out (UWO). 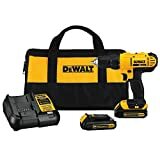 The drill is also compatible with the nearly 200 other tools in the DeWalt 20v Max Lithium-Ion family, so if you’re a DeWalt household, this is the best 20v cordless drill for you. You’ll find a single sleeve ratcheting chuck on the drill that can accommodate 1/2 inch drill bits. The chuck claims to provide a super tight grip on its bits. You can use the drill at two speeds: slow (450 RPM) or fast (1,500 RPM). People who have used the DeWalt drill/driver have been impressed by its longevity. Some had had the drill for several years and had noted that it works as well after years of use as it did when they purchased it. One thing people did complain about was the battery life and quality. Some noted that their battery claimed to be charged after just a few minutes, but only gave them a limited amount of power. Others noted that their batteries didn’t last that long. If you were impressed with the freebies included with the Cartman drill, wait until you get a look at what the WORX Switchdriver provides. It comes with a 67-piece drill bit set. In addition to including all the drill bits you might ever need, the WORX drill/driver features a special rotating, dual chuck. If you need to switch back and forth between two different bits during a project, you can do so with just a flip of a switch. The drill/driver has a 1/4 inch chuck with a hex quick change. The design of the chuck is meant to make it easier to change bits, without the need for tools. Another nice feature of the WORX drill is that it has an LED light so that you can work in dark conditions. The biggest complaint that users of the WORX drill had about it was that the torque was very weak. People noted that they struggled to drive screws into pre-drilled joints. Others noted that the torque adjustment switch on the drill seemed useless. People who liked the drill seemed particularly thrilled with the dual chuck. As you might know, not all battery types are the same. Some batteries seem to lose their charge almost instantly, while others can keep going for hours. Batteries also differ in the amount of power they deliver and in the type of material they are made from. Here’s what you need to know about cordless drill batteries. Voltage – The battery’s voltage determines how much power it can provide. Usually, when you see a 20v battery, that means it can deliver 20 volts of power with no load. Other common voltages (for DIYers, at least) are 12v and 18v. Material. You usually have three battery material options to choose from – Lithium-ion, Nickel Metal Hydroxide (NiMH), and Nickel Cadmium (NiCd). Lithium-ion batteries are generally the priciest, but they also last the longest. Self-Discharge. When you’re not using a battery, it’s often slowly losing power. Lithium-ion batteries have a slower rate of discharge than the other two. Memory effect. Some batteries, such as NiCd “remember” how often and how much they are charged. If you don’t charge your batteries fully or charge them before they are fully drained, they “remember” that and begin to hold less of a charge over time. Run-time. How long a battery can stay charged or can run after being charged is influenced by its voltage and capacity. Another thing worth knowing about cordless drill batteries is that they often work with other cordless tools designed by the same manufacturer. So a 20v battery that’s made for Brand X’s cordless drill is also likely to work with Brand X’s cordless saw or sander. Now that you’ve gotten the scoop on cordless drill batteries, you might be wondering about the benefits of going cordless versus plugging in your drill. Both corded and cordless drills have their uses, their benefits, and their drawbacks. Here’s what to consider when choosing one over the other. Corded drills are great when you need steady power. If you’re near an outlet and don’t want to run out of power mid-drill, a corded drill is the way to go. Cordless drills offer greater flexibility. You can use a cordless drill (provided the battery is charged) pretty much wherever. There’s no wait with a corded drill. You don’t have to wait for the battery to charge — just plug it in and get to work. Cordless drills are ideal for quick jobs. As long as you have a charged battery, you can pretty much just grab your cordless drill and get to work. These tips will help you use the best 20v cordless drill safely and easily. Wear eye protection. Always put on a pair of safety goggles before using your drill. You don’t want anything to get in your eyes. Choose the right bit. Size and type matter when it comes to drill bits. If you’re drilling wood or metal, choose a bit designed for cutting through wood or metal. To drill into brick, you’ll need a masonry bit. Label the bit. Wrap a piece of painter’s or masking tape around the bit at the depth you want to drill. That way, you won’t make a hole that’s too deep. Go slowly. To avoid overheating or straining the motor, go slowly when making holes. Hold the drill straight and steady. When you drill, hold the tool perpendicular to the surface you’re drilling. As a screwdriver. Most cordless drills are also cordless drivers and come with Philips and flathead screwdriver attachments. To make large holes. Attach a hole saw bit to the drill, and you can cut pretty sizeable holes out of wood. To make pilot holes. You can use a cordless drill to create pilot holes, which can allow you to place a screw in wood without splitting it. To mix paint or concrete. You can buy a bit that lets you turn your drill into a power mixer for paint or concrete. As a sander. You can attach a barrel sander bit to the end of the drill and use it to sand curved surfaces. If you’re looking for the best 20v cordless drill for use around the house, we’re going to recommend the BLACK+DECKER LDX120C 20V MAX Lithium Ion Drill/Driver. It’s got the most budget-friendly price, it has the features you need for quick, light jobs and it has a 20v lithium-ion battery. You’re not going to build a mansion with the Black+Decker, but for light jobs, it’s the best of the bunch.